Grass Shear FGS-2000 Useful for cutting grass & small edges. — • Hardened steel blades with rust preventive coating. • Blade Size - 175mm • Versatile 3 positions blades swivel for easy cutting in horizontal. diagonal or vertical positions • Convenient Safety lock. We are engaged in manufacturing and supplying of high quality grass shear used for various gardening purposes. These are manufactured as per the industrial standards by using hi-tech facilities and high grade raw material. We can provide these in customized size sand specifications as per the requirement of the clients. 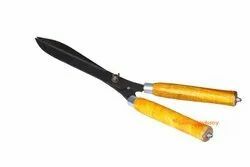 Grass scissor-commonly use for cutting grass from small lawn and thin branches. We feel proud to introduce ourselves as an eminent manufacturer and supplier of an assorted range of Grass Sheer. Our provided grass sheer is known for its dimensional accuracy and high strength. These grass sheers are checked in terms of quality for ensuring the flawlessness from our end. We are an accomplished organization which has gained name and fame in providing Grass Shear to the customers.